ELEVEN’s innovative executive leadership program will help you unleash your full potential and take you to an 11/10 in every aspect of your life. 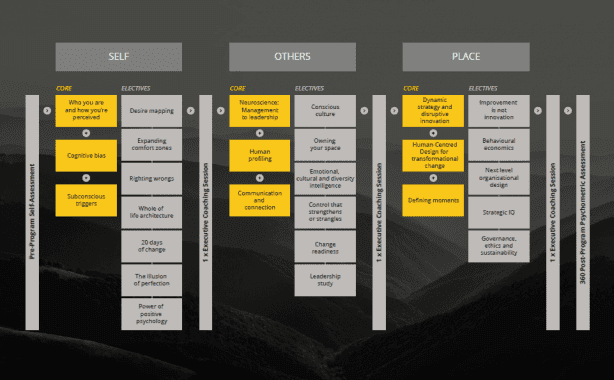 Designed to stand out from traditional programs, the ELEVEN leadership program creates an environment to help you understand your true self and further your development of 11 key attributes in order to become an extraordinary leader. The ELEVEN leadership program has been developed specifically for executive leaders (or soon-to-become executive leaders) who aspire to a higher level or to make a greater impact in their role. By gaining deeper insight into your biases, perceptions and sense of self, the program is designed to give you the confidence you need to maximise your performance as a leader. A stronger sense of self, and what you stand for as a person and leader. Insight into cognitive biases (including your own), how they impact behaviour, and the practical application of this insight to become a more effective leader. Improved communication and collaboration styles to help others achieve greater performance and job satisfaction. Insight into Human-Centred Design and practical applications for everyday leadership. Understanding of dynamic strategy and disruptive innovation, and the creation of dynamic leadership. Practical applications of the latest neuroscience research into personal and leadership behaviours, and the difference between management and leadership. Understanding of leadership in the context of an organisation, how culture and organisational strategy determine leadership style, and a leader’s role in creating cultural beliefs and behaviours. These ELEVEN attributes of great leadership exemplify the very best of what it is to be human. Tap into your inner child to allow yourself a sense of wonder and original thought. Agility is the new essential, and true entrepreneurs find themselves evaluating the need to pivot the business model. Give yourself permission to deviate! Know your triggers that prevent true compassion when other people’s differences and choices feel confronting. Own your space, welcome truths, be who you are, and create a safe space for others to do the same. Connect divergent dots in new ways to create ideas that break through. Foster an environment that feels uncomfortable for all the right reasons. Open your mind to your blind spots no matter how confronting the FIX might be. Finding your purpose is one of life’s greatest quests. Confront your purpose, stay curious to it, and allow it to evolve when it needs to. Bravery is the enemy of average. Embrace the role of courage and discomfort in leadership. Inspire strength in yourself and others, especially when it feels hard to do. The cornerstone to relationships. Listen to understand rather than listening to respond. It takes courage to be yourself. Address the default strategies you use to avoid being vulnerable. Developed by a group of neuroscientists, psychologists and psychotherapists, the ELEVEN leadership program is centred on attributes instead of competencies and utilises multi-sensory adaptive learning specifically designed to achieve real and sustained behavioural change. It begins with a self-assessment of your thinking and learning preferences to create a personal learning pathway completely tailored to you. Delivered over 12 months, the program architecture comprises targeted, interactive and experiential modules within the contexts of self, others and place to achieve meaningful personal and professional development. Delivered over a period of 12 months (approximately 1 day of face-to-face time per month), the ELEVEN program is designed to stimulate all of your sensory, learning and cognitive preferences through multi-sensory adaptive learning, while avoiding cognitive overload. *Optional inclusions. Please contact us to discuss the program package best suited to your individual needs. Allows you to identify behavioural tendencies, learning preferences and development opportunities in order to create your tailored learning pathway. Delivered monthly, these full-day workshops allow you to work with and learn from our experienced facilitators, as well as a small cohort of 8-10 senior peers. Choose from a collection of interactive and engaging seminars and workshops delivered by experienced facilitators to enhance your learning experience. Choose from a series of case studies, e-learning modules and webinars delivered over the course of the program to complement and reinforce your learnings. Unlimited access to expert facilitators, executive coaches and your cohort of senior peers provides ongoing support, feedback and learning. Choose from a panel of coaches to provide you with guidance and support, and allow you to discuss your progress and implementation of your learnings. If selected, these sessions can provide an opportunity for your manager or sponsor to be involved in your experience and support your development. Provides you with an opportunity to reflect on your ELEVEN journey, followed by a debrief with an executive coach to discuss your results and further development. Invitation to give back to those in need, providing you with an opportunity to live the ELEVEN attributes in an overseas community that would benefit most. Introspective view of who you are and what you stand for by gaining a deeper insight into your own biases and how they impact your decision making. The latest neuroscience research and the practical application of that research to your personal and leadership behaviours to better understand and inspire others. Your role in and readiness to create impact and change in an organisation or industry by being challenged to think differently and adopt new leadership behaviours. The program is suitable for individuals, as well as teams from the same organisation. Corporate programs can be booked for any date and we have multiple public intakes scheduled throughout the year. If you have any questions or would like to register, please contact us on 1300 880 121 or eleven@kaplan.edu.au. Alternatively, complete the form below. Your privacy is important to us. You may request access at any time to your personal information by contacting us.